An age specific martial arts education program for ages 4 to 6. This class is a mix of fun and discipline. 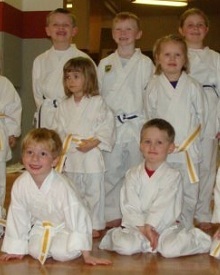 Children will learn the basic skills of Karate, develop fine motor and listening skills as well as respect for others. Sensei will reinforce the importance of “Respect”, “Listening”, “Trying one’s best”, and “Being a good person”. There is a short meditation at the beginning and end of each class. Our classes are fun and dynamic. When students do a good job in the class, they will receive a ribbon at the end of class and a treat. When they do a really good job for several classes, they will be invited to test for their next belt. Come in today to try a free trial. See for yourself why our families join and remain members for a lifetime of Karate!